Performance of security screening varies by such things as amount of clutter in the bag, the activity at the checkpoint, as well as the ability of the person screening the objects. It would be of benefit if these screeners had access to experts to review questionable images. If experts were available when there are questionable items in the object being scanned, the screener could be more effective by consulting with and getting feedback from remote experts. The TSS Teleinspection capability provides remote experts-on-demand for screener assistance, or for expert review of particularly challenging images. 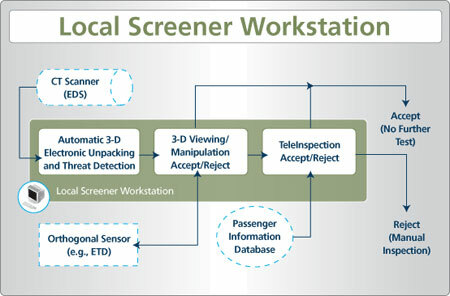 The operator or automated screening software has the ability to send the image out for a separate review, or for feedback on the image. The operation can be used to make the decision, or to assist the operator in the decision whether manual or automated screening is required. Security Screeners and Supervisors can benefit from the use of TSS Teleinspection. The use of Teleinspection ensures that highly trained experts review the more difficult and challenging bags. This decrease the work load on the screener, while improving the overall security of the checkpoint. When new threats are found, this new threat can be detected quickly by leveraging and training the experts, and then having general screeners detect any questionable items. For more Information on Teleinspection, contact us.